Earth Day activities were planned across the country on April 22, 1970. Grand Rapids was also included in those communities that celebrated Earth Day. Based on articles from the Grand Rapids Press, there were three separate activities that received attention in Grand Rapids. In the afternoon, there was an event with song and signs on the Calder Plaza, with the featured speaker being Rep. Guy VanderJagt, a Republican from Cadillac. The comments by VanderJagt, as reported in the Grand Rapids Press, spoke of the urgency to take action. However, the representative from Cadillac framed the environmental urgency in terms of how much people would be willing to pay in taxes to get clean air and clean water. There was also a large community event, with an estimated 1,500 people in attendance at the Civic Auditorium in the evening. The event featured images on the big screen, musicians and speakers. Senator Philip Hart got the biggest applause from the audience, according to the Press. Hart spoke about not separating humanity from nature and that the “drive to save the environment” will outlast recent crusades such as those of civil rights and the war on poverty. At one point the image of Vice President Spiro Agnew appeared on the screen, which received a lot of boos from the audience. Representative Gerald Ford spoke, and he too received boos, shouted comments about the war in Vietnam and sometimes loud stamping of feet. There were a whole list of other speakers, including representatives from business, the faith community and non-profits. The other major activity that people took part in on Earth Day in Grand Rapids in 1970, was a protest organized by students from the Grand Rapids Junior College. 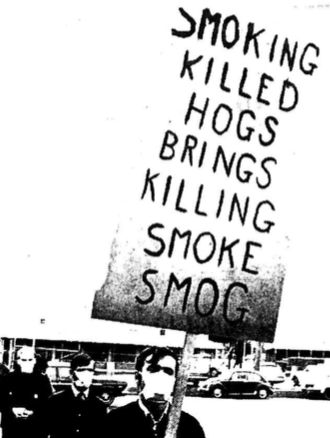 Students chose to protest at a meat factory, because of the pollution the business was emitting as a result of how the company cured the meat. The factory had been the target of complaints from neighbors for years because of the pollution. The owner of the business was cited as saying that he was in the process of addressing the air pollution, but didn’t know what kind of timetable there would be to address the issue. This last action, organized by students, is more reflective of the kinds of actions people were taking across the country, which focused attention on corporate pollution or structural pollution. 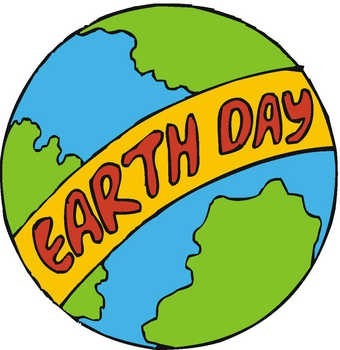 In fact, in its early years, Earth Day actions were either to engage in collective projects that would promote ecological integrity or to confront those most responsible for environmental destruction, the corporate/industrial sectors. This entry was posted in Environmental Movement and tagged corporate pollutors, Earth Day 1970 in Grand Rapids, student protest on Earth Day. Bookmark the permalink.